ALERT Volume 35 (July 2016 – June 2017) – Castle Publications, Ltd. The ALERT NEWSLETTER is published every two months. 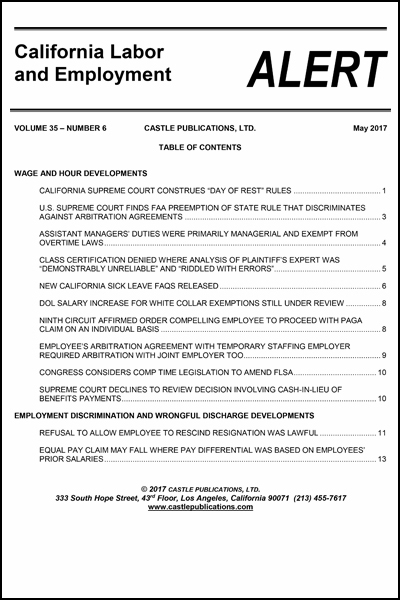 It provides an up-to-date and helpful analysis of important developments in California and Federal Laws concerning personnel and employment law matters. 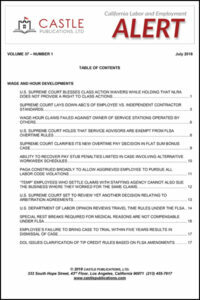 This publication is the living supplement to Richard J. Simmons’ Wage and Hour, Employment Discrimination, Employee Handbook and Personnel Policies, and Wrongful Discharge and Employment Practices Manuals. The ALERT assists employers to identify and avoid common pitfalls and stay on top of new laws, decisions, and regulations. The ALERT NEWSLETTER provides brief, concise and understandable summaries of significant developments. 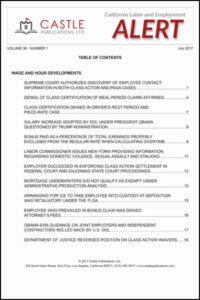 The ALERT reviews and analyzes – significant cases in California state and federal courts, important new statutes, regulations and laws, and key developments at the administrative level, including the EEOC, the FEHC, the Labor Commission, the Wage and Hour Division, and the NLRB.